2008 HTC Android on the left, 2014 Samsung S5 on the right. Pop Quiz #1 : Which phone would you rather have? You want the Samsung S5, I’m sure of it. I know this because our brains all work more or less the same way when it comes to figuring out the best available option. You mentally scanned the two images, ran a quick internal comparison, and it was done. If these phones were people, the S5 is a beautiful prom queen and the HTC is a dodgy-looking pawn-shop owner. How exactly did we reach this decision? Simple: We compared attributes. One has sharper colors than the other. A bigger screen. Fewer clunky-looking buttons. And so on. It turns out that our brains are very good this sort of thing. Years of living in a consumer-driven economy and culture only reinforces our ability to quickly choose the most awesome alternative. We’ve been in training practically since birth to perform this sort of analysis. Chances are really good that you didn’t even have to consciously think about it in order to draw your conclusion. With a single glance, you took the image in and knew the correct answer immediately. Congratulations. We are both expert-level consumers. I’m patting myself on the back now, and you should be too. Pop Quiz #2 : Which phone will make you happier? Your instinct will be to provide the same answer and go with the S5. Better is happier, right? Wrong. Turns out, we are not expert-level soothsayers when it comes to predicting how happy any particular material purchase is going to make us in the future. This is mostly because we don’t spend much time thinking about how much pleasure our current pile of possessions is providing us with. Instead, our consciousness has moved on to the next thing that we want. When is that dang S6 going to be out, anyways? The idea of diminishing returns is that a little of something is great, a lot of the same thing is a little bit better, and an infinite amount of it isn’t measurably better than a lot. The simplest example I can think of is water. On any given day you need to drink maybe a quart of fluids to feel comfortable. If you don’t get it one way or another, you’ll become thirsty. You might feel better with two quarts, spaced over your 16 waking hours. But two hundred quarts wouldn’t do you much more good than just the two. The personal return on having more water becomes effectively zero after you’ve got two quarts per day. The concept of diminishing returns can be applied to just about anything, and is the key to becoming better at understanding whether or not your next new purchase is going to actually result in an improvement in happiness. But you probably already knew all of that. The other critical piece of the equation is to get your arms around what generally makes you happy or miserable. Deeply religious people are happier than non-believers or agnostics. Interestingly, material goods are not cited as a variable in the happiness equation in scientific studies. In other words, when reflecting on their lives and thinking about what makes them happy, people don’t really give a damn about the stuff they own. This is due to hedonic adaptation, which is fancy talk for saying you get used to new stuff really quick. Let’s get back to that cell phone comparison. I know, I don’t want to look at that ugly HTC anymore either, but it’s a useful example for our purposes. The first and only question we should have asked ourselves is: Will either of these phones increase my levels of happiness? Taking the science of happiness into account, we know that things don’t make us happy, but relationships and experiences do. Will one of these cell phones improve our relationships with others over the other? How will the purchase of a new device help us to achieve important goals in our life? They both make calls, which facilitates communication and will therefore help create and strengthen ties with friends and family. They both browse the internet and have map functions that will help you drive to someone’s house or get to that new hiking spot you wanted to check out. Both provide basic core-utility needs that your standard human requires in the modern age. Then there’s the money question. The S5 is $200 and also binds you to a 2-year contract that will run you a minimum of $50 a month. On the other hand people are giving away HTC for practically nothing and you could then use Ting or a similar budget provider to pay as little as $10/mo for service. Some quick math shows that the savings on the HTC over two years would come to $1160. That’s some serious cash. Compounded over ten years at the US Market’s average return of 7%, you’re looking at $2,281. If you make $40 an hour, and take home perhaps $29, it takes you two weeks of earnings (78 hours) to come up with the real difference in cost between the two phones had you invested that money instead. Is the increase in satisfaction from owning the S5 over the HTC worth two weeks of your life? Also, by the time that S5 contract runs out, the S8 will be out and you’ll be confronted with the same dilemma again: which phone will you buy? This model of consumption spills out into everything. Once you get used to buying bleeding edge stuff, you’ll find yourself upgrading every couple of years. Your home PC, your music player, your receiver, your speakers, the six televisions in various rooms in your house or apartment, new laptops and tablets, new guitars and soundboards, new cameras with more megapixels and storage. You need a new e-reader, a wireless blender, a car with parking assistance and built-in blu-ray players, and a toilet that talks to you. If you keep buying the newer (better!) model of everything, you will be working for the rest of your life to pay for this stuff. If you don’t love your job, this is therefore a bad trade. Back to that question: Should you get the best phone, or settle for imperfection? The real solution is to retrain your brain to recognize that getting the cheaper option isn’t “settling” at all: It’s winning across the board, plain and simple. Now you can buy the not-as-good phone and feel like a champ instead of coming out of the transaction feeling deprived. And you can do this because you understand the game. You are working to maximize satisfaction and happiness in your life, rather than trying to collect all the best toys. Did I lead a happy life today? Did I do anything to make myself and others feel good about being on this planet? If you spent all day comparing phones, the answer to the above is going to be a big fat no. I bought a lot of junk in my early twenties before I figured all of this stuff out. I’ll admit it: I actually believed that getting that Dolby 5.1 system with top-tier speakers would give me a home theater experience that was so unbelievably awesome that I’d forget all about the whistling hole of emptiness in my chest and enter a permanent state of bliss; Nirvana Achieved Through Audio Perfection. Because back then, I kept asking: What’s better? Should I buy this or that? What’s the feature list? I thought that better was happier. I confused the two things because I was programmed to confuse them — we are all deliberately taught to equate the two, that the pursuit of happiness is the pursuit of things. This messaging starts when we’re three, the instant we’re old enough to start recognizing brand logos on things around us, absorbing advertising with our little spongy brains. And it doesn’t end until we’re dead. 2) Financial independence. People associate the word saving with being miserly, so I flipped this around in my head and started to think of it as spending on FI. I’m blowing cash on RE like Charlie Sheen is shelling out for blow. My spending went down and my level of general satisfaction in life went up. Sweet. Yep, I’m back to the cell phone topic. I didn’t get one until I was twenty six, in 2005. I held out mostly because of the cost. My line of thinking was, as you could guess: I don’t want to spend that money on something that won’t make me happy. Nope, what I wanted to do was ruthlessly maximize the amount I was spending on financial independence, so I could quit the work game as soon as I possibly could. As it turned out, everyone I knew started to use their cell phones as the primary method of communication and planning. Since I didn’t have one, people sometimes couldn’t contact me to invite me to an impromptu gathering. This development was sort of unexpected for me. I just hadn’t considered that the ubiquity of cell phones would cause peoples’ behavior to change so dramatically. A lot of folks simply stopped figuring out in advance where they were going to meet up and hang out. Instead they’d say: Hey, I’ll be in your area around six, I’ll call your cell and we’ll work it out. I didn’t want to lose friendships and miss out on fun social experiences, so I bought one. In this rare case, asking the question What will make me happy? resulted in a material purchase. I adjusted my behavior to accommodate the changing social landscape and haven’t regretted it in the slightest. In order to find a middle ground between wanting to fix my communication issues while continuing to spend as much as I could on FI, I bought a minimal-feature set device that satisfied baseline functional requirements and didn’t bust my wallet. In this case, a little bit of cell phone went a long way. On a related note, I’m currently using an old droid that I bought used for sixty bucks with no-contract Ting service for $17 a month. I’ll be making due with this until it dies. Do you think older generations led miserable lives because they didn’t have the wonders of our uber-modern world? What percentage of time do you think they spent doing comprehensive analysis of cross-product evaluations in their lives? How do you feel about our lives in comparison to theirs? Are they truly better? Are we happier? These questions aren’t entirely rhetorical. Science tells us that happiness in the United States has remained flat since the 1970s. This is despite huge gains in GDP and personal wealth over the same 44 year period. All of this stuff isn’t making us feel any more satisfied or fulfilled. Go figure. Since then, there’s been a lot of work done to remaster the series. The videos were released in every conceivable format, from VHS to BetaMax and Laserdisc to DVD and finally 1080p formats like Blu-Ray and streaming sources like Netflix. The audio has been redone too — channels added, improved fidelity across the board. Finally, Lucas added new content in the form of a) throwing in a few previously deleted scenes, b) editing existing scenes like making Han shoot Greedo in retaliation and c) adding some new CGI stuff like flybys of major cities. The newer releases unquestionably look and sound better. The source material is higher resolution. The contrast is better. Technical glitches have been smoothed out: the green boxes around the tie fighters have been removed, and the light saber effects are sharper. Top: DVD. Bottom: VHS Simulation, complete with CRT scan-lines. Despite the fact that the newer releases clearly look better, I’m perfectly fine watching the original films on an old VHS player. The story and ideas are great, which is why I keep coming back. 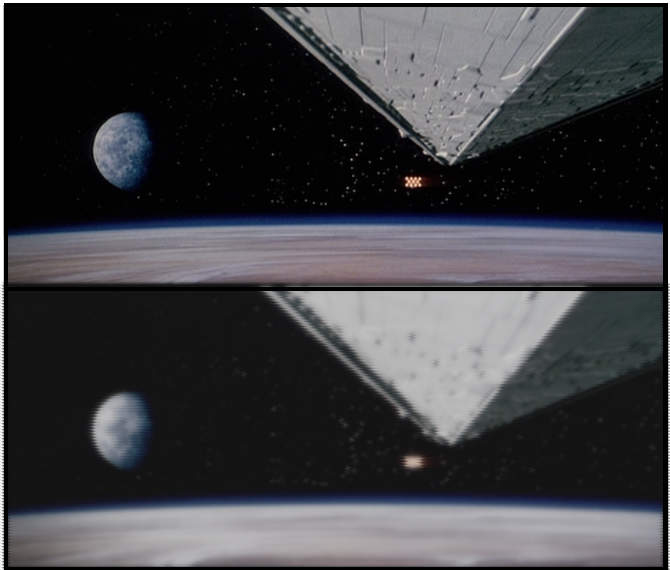 I never think: Man, I want to watch Star Wars right now — but only if I can see it in 1080. If I have to settle for 480i or worse, screw it. What I do think is much simpler. I want to watch Star Wars. I haven’t seen it in a while. Resolutions and tech specs have very little to do with the underlying experience of the films. Also, my observation here is that the power of diminishing returns ensures that the harder people work to marginally improve how things look and sound, the less impact said improvements will have on consumers. In other words, Star Wars already looks pretty good. There’s also a related MMM post about not sweating tiny details when it comes to making consumer choices which fits in pretty well on this topic. I’ll also point out that resolution and that sort of thing is something you only really notice for the first five or ten minutes of a movie. After that, the plot engages you and you become lost in the content. Either the content is good and you’re now enjoying the movie, or the content is bad and you want to turn it off. I’m no dummy — I can tell what looks better. But I also can now differentiate between Better and Happier. And let me tell you: Quadrupling the resolution of Star Wars I : The Phantom Menace still won’t make it anything other than what it is: a dumpster full of sadness. This entry was posted in Backstory, CurrentLife, Finance. Bookmark the permalink. Better != Happier. Simple but so true! I love the phone example, but I’d also toss out cars as a common place where this sort of thinking kicks in. Folks so often think a car with bluetooth and power everything is “better”. Maybe it is, maybe it isn’t. But the happiness aspect is that the car gets you from A to B. Our 1996 Honda Odyssey isn’t pretty and might have a sometimes working tape deck… but darned if it doesn’t take a load like a pickup and keep running with minimal maintenance. I can honestly say that a Better car wouldn’t make us Happier. Good point on the cars. I remember reading a study about drivers who get big-ticket vehicles, 100K lamborghinis etc. After 4 months, the fact that they’re driving a primo luxury ride doesn’t even rate on their mood — they’re not any happier while behind the wheel than your average Yugo owner. I share a 2004 Toyota Corolla with my wife and it’s more than enough car for the both of us — still only has 58K on it, should take us through the next 15 years or more. We’ll quite happily wear that puppy out like an old shoe. And hey, I absolutely acknowledge that once in a while better really is happier. Now I’m curious… do you actually use a 2008 HTC Android? If so, I’m very, very impressed! I wish. The HTC is comically bad, which is why I used it in the example for fun. I’m currently on 2010 Samsung Epic 4G which was the most inexpensive phone I could get while staying on Ting’s supported device list. The device makes me feel like I’m 15 years old because it’s got “Epic” in the name, very awesome. And while I don’t exactly recommend it, it’s completely functional, which works for me.